Personally, I believe it's because there's usually so much butter left at the bottom of the bag, but this doesn't explain why there would be a difference for non-buttered popcorn (which I think there is...). So, which one of these claims, if any, are correct? Popcorns expand when they pop, because of the moist inner of the pop corn, depending on the corn, the number of unpopped kernels varies. P225 exhibited the highest (47%) number of unpopped kernels, whereas AP416 (27%) was higher than P615, P612, P415, and EXP92233 (around 16%). AP414 was the best hybrid as it had the least number (4%), whereas the remaining hybrids had 9-12% unpopped kernels. Taken from the paper "Role of the Pericarp Cellulose Matrix as a Moisture Barrier in Microwaveable Popcorn" by "Agung S. Tandjung". Number is usually around 10-20% was how I took it from that paper. There is not any crazy reasons why the numbers doesn't match. On popcorn packages they estimate how much popped popcorns the end result will turn into. I thus assume they take in consideration that not all kernels pop. In the estimation on the amount of popped popcorns you will get they the number thus is lower than if all kernels popped, and if you multiply estimation with their energy value you will fall short of the unpopped's energy value. This is simply math, not some magical phenomena or butter being stuck inside the bag. 15% of kernels doesn't pop in their estimation, most probably, which is why if you multiply estimation with popped energy value only get to 85% of the energy value of the unpopped kernels. 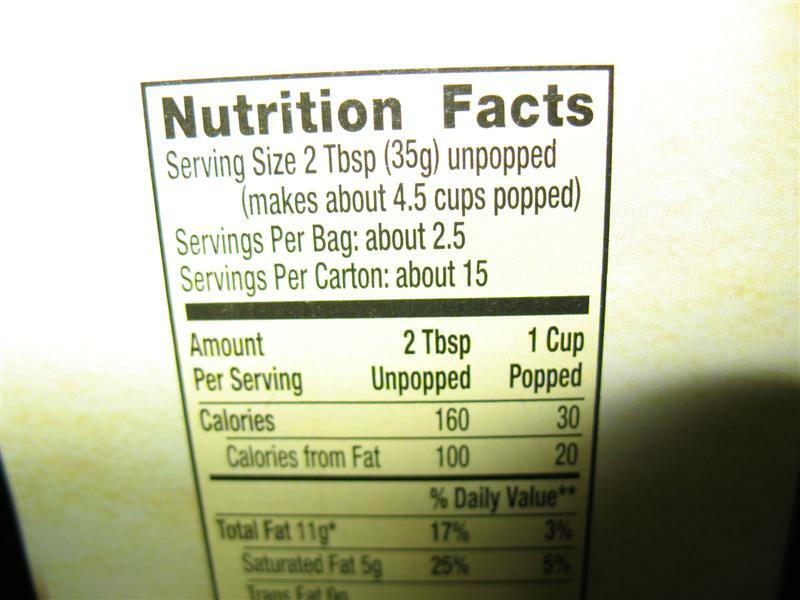 Many people wonder why unpopped popcorn has more calories in comparison to popped ones. The answer lies in popcorn kernels, popped popcorn has less kernels, therefore less calories. What I mean to say is, a cup of unpopped popcorn will have more calories because of the large number of kernels that are present. On the other hand, popped popcorn of the same measure will have less calories because of the absence of kernels. Moreover, a cup of unpopped popcorn will give you around four cups of popped popcorn. Therefore, the former has more calories. The popped popcorns have less kernels. Why? Because not all kernels pops. I asked "Garret Popcorn Shop" if my assumption was correct. Hello. On popcorn packages it's listed that X amount of unpopped popcorns turns into Y amount of popped popcorns. In the energy listings there is values for popped popcorns and unpopped popcorns. If you multiply the popped popcorn value with the estimated amount of popped popcorns you'll get, the energy value is lower than for the unpopped ones. Does this mean in the estimation that you take in consideration not all pop corn kernels pop? This is my original mail. Dear Mr. Hambraeus, Thank you for contacting Garrett Popcorn Shops. We appreciate your inquiry. You are correct, we do take into consideration the ratio of unpoped popcorn kernels and it is for this reason the energry value is lower. Please let us know if you have any further questions or concerns! This is the answer I got from Garrett Popcorn Shops. They gave an answer directly. The reason the values doesn't add up is because they take in consideration the ratio of unpoped popcorn kernels. 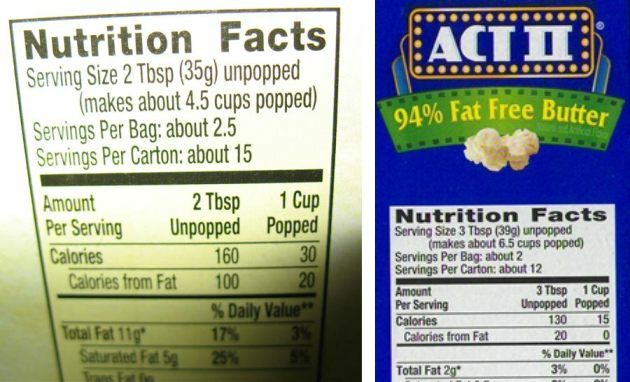 So it is at least true that popcorn nutrition labels show a difference between popped and unpopped (here: 25% difference). If we're to take Micah's article, the average percentage of unpopped kernels after microwaving is between 4% and 47%, or 25.5%. So it fits very well with the data available. I'd say it's perfectly reasonable to think that the difference is due to the average number of unpopped kernels after cooking. Can a bomb calorimeter meaningfully measure food calories? How many calories is starving? Does Tilapia have a greater inflammatory potential than bacon?